A striking industrial design combines form and function in the Sennheiser HD 800S. Its layered metal and plastic headband construction aren't just a bold aesthetic scheme; they serve to attenuate vibrations to the earcups. Handmade microfiber earpads offer exceptional comfort for long periods of listening enjoyment. Crafted for perfection, the HD 800 S is precision-built in Germany from the finest materials and components. 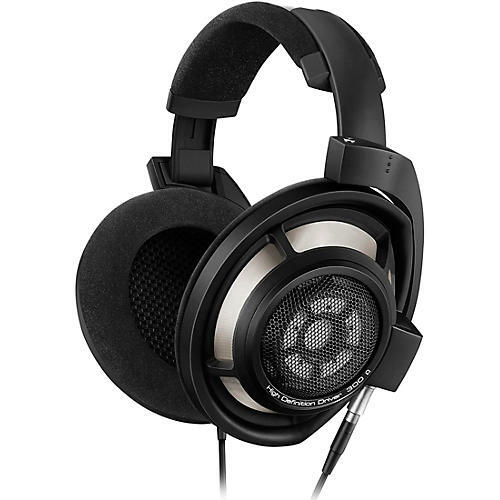 The transducer is encased by stainless steel, while the headband and headphone mounting utilizes advanced materials developed in the aerospace industry for high strength with minimal weight. The enhanced sound reproduction of the HD 800 S is achieved through the addition of absorber technology that was pioneered in the Sennheiser IE 800 – a breakthrough that preserved the audibility of very high frequency sounds by eliminating a phenomenon known as the “masking effect,” whereby the human ear struggles to hear frequencies of sound when lower frequencies of a higher volume occur at the same time. By absorbing the energy of the resonance, Sennheiser’s patented absorber technology prevents any unwanted peaks and allows all frequency components – even the finest nuances – in the music material to become audible.